Composed by Stralsund Gesangbuch, 1665. Arranged by Evelyn R. Larter. General Worship. Score. 9 pages. Published by Evelyn Larter Music (S0.191053). 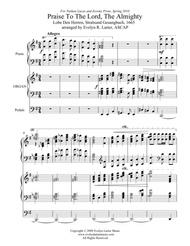 Popular in Christian worship for centuries, the well-known hymn tune Lobe Den Herren is given rousing treatment here as a piano/organ duet. It was written several years ago for two of my students who were competing in a national arts festival for Christian schools - happily, they won! 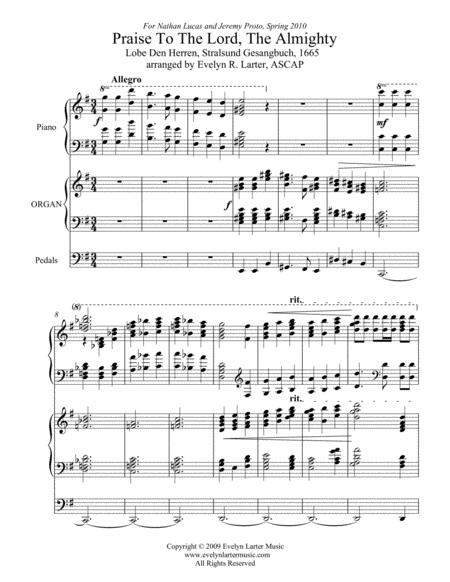 At just over 2.5 minutes long, it is suitable as a church prelude or offertory, or as a competition piece. The MIDI MP3 comes with standard organ registration - it will sound a lot better with some intelligent use of available organ sounds! More information on my music can be found on my website, www.evelynlartermusic.com, and on my Facebook page for Evelyn Larter Music.